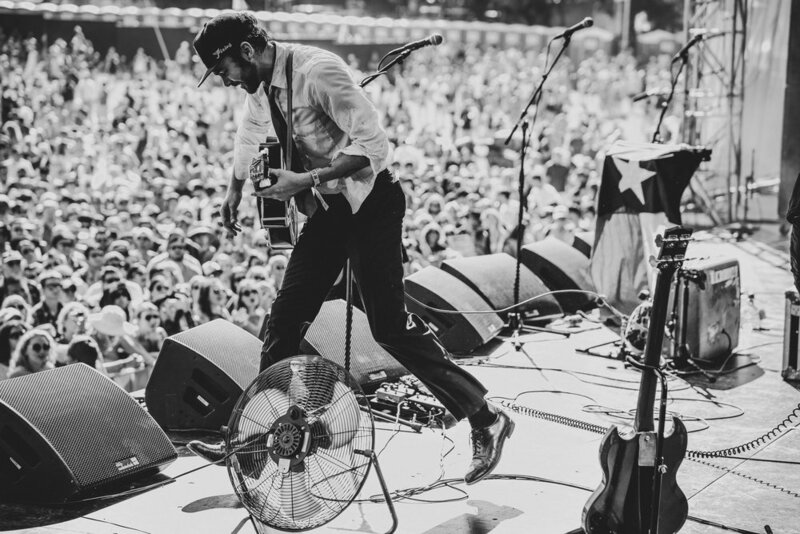 Sony Artisan Chad Wadsworth has been a fixture in the concert photography scene in Austin, Texas for over a decade and it all started in 2005 while watching one of his favorites bands, Spoon. In a recent phone interview, Wadsworth said that he grew up with a camera in his hands and even worked in the camera and video section of a department store while growing up. He remembers telling the photography teacher in high school that he wanted to create images like Anton Corbijn had in U2’s“The Joshua Tree” album cover. Wadsworth forgot about photography for a time during college and even afterwards as he started a business. He rediscovered photography after the birth of his children like many people do when documenting special family moments. Living two minutes from downtown Austin, it was then that Wadsworth made the decision to take concert photography serious and to attend shows with his camera around his neck. “I called the local radio station and they were putting on and actually producing a show with a local band, Spoon, who are one of my bedrock favorite bands,” said Wadsworth. He asked if he could take some photos for the radio station and the answer was “nah, nah, we’re good.” Wadsworth took his camera anyway and ended up with images that he still cherishes to this day as being “pretty good with a crappy camera in low-light”. He sent the photos to the radio station and they liked them enough that Wadsworth now had media credentials to shows around town. “It was a train after that. It’s like life – you meet people and make connections and get lucky,” referring to how his career evolved after that. It was a matter of months before he had built a relationship with Spin Magazine after meeting one of their photographers at ACL Fest in Austin. Wadsworth spoke passionately about his craft and the nuisances of shooting in the “the pit”, which is the small and narrow space between the stage and crowd for media members. There was one show that he remembered vividly, mainly because there wasn’t a pit at a small bar in Austin for the local and beloved band, At the Drive-In. The handful of photographers showed up early and got in the first row of what was an energetic crowd, to say the least. He went on to discuss the time he met Bill Murray at a show and had him sign a Connor Oberst album as well as the recent trip he made to the White House while shooting a couple tour stops with Elle King last year. He documented the exclusive tour along with the before and after of her shows at the legendary, 9:30 Club in Washington, D.C.
Wadsworth would love to do more documentary photography in the future because he feels like there is so much more to capture than what is happening on stage. Ideally he would travel with the band on the road covering the whole scope of things like sound check, the fans, meals, the concert, after-parties, etc. He gets asked every so often about how to be successful as a professional concert photographer and his answer was simple. What was the biggest lesson you learned so far about being a photographer? One of the hardest things for any photographer is to define their vision. It’s an ongoing lesson and I haven’t learned it yet but I’m getting there. I think right now we are seeing a lot of emulation and repetition in the IG space and I hope that changes. What do you do when a camera is not in your hand? Hah, editing is the easy answer - whether I need to to complete a job or just to practice. For good or bad I’m obsessed with the edit and its impact on the final image. What is your go to camera + lens combo? Sony RX1RII is my goto for its compact size, full frame sensor and 35mm f/2 lens. I’m real comfortable with that field of view for everything from a landscape to an environmental portrait but I’m starting to shoot wider as a default and for that I’ll go with an A7 family body (or A9 soon!) with something like the Zeiss Batis 25mm f/2. What do you look for in a shot? Impact in terms of emotion - what feeling does the image impart? This ties is with the biggest lesson question above and defining your vision. Best advice for new and upcoming photographers? Learn to tell a story. I know we are living in a one shot Instagram world but let yourself become a journalist. That winning image will emerge. For the longest time after I started shooting music, I only wanted to capture the band performing on stage. It wasn’t until I turned the camera on the crowd and started documenting the event did I feel like my photography had impact. What is your dream project? I look back at the careers of photographers like Elliot Erwitt who have been there photographing Kruschev and Nixon arguing one day and on a movie set with Marilyn Monroe another. I don’t know if that opportunity exists today for any one photographer in the way it did 60 years ago but I would love to have it. Whats next for you in photography? Good question. I’ve been shooting music for 12 years and I go through peaks and valleys when it comes to my motivation for the scene. Right now, I’m excited to shoot more live music, both in the pits and behind the scenes but I also want to focus on personal work which may or may not feature music - we’ll see.